The Divine Liturgy is the most important activity in our Orthodox Christian lives. It is the time when the people of God, the ekklesia, stand before Him in reverence, worship Him and entreat His mercy, and receive Communion with Him for the forgiveness of sins and eternal life. Because of its importance, any changes to the Divine Liturgy must be studied with caution. I feel we are at the cusp of such a change relating to the responses of the deacons who serve the Holy Altar during the Divine Liturgy. Much has already been written concerning the ever-changing role of deacons in the Coptic Orthodox Church. There is an excellent collection of articles written anonymously by a Canadian Copt on the subject. For the purpose of this post, however, I would like to focus on what seems to be the growing and conscious elimination of the deacons’ responses in the Litanies. For those unfamiliar with this terminology, consider the following example from the Coptic Divine Liturgy of St. Basil the Great. Remember, O Lord, the peace of Your One, Only, Holy, Catholic, and Apostolic Church. Pray for the peace of the One, Only, Holy, Catholic, and Apostolic Orthodox Church of God. As we can see, this one litany contains responses for the priest, deacon (i.e., the one serving at the Holy Altar), and the people. The litany has been written this way for centuries, but only in modern times, we find many parishes completely skipping the deacons’ responses, not only during “faster” Divine Liturgies on weekdays, but even during Sunday and festive Divine Liturgies, too. Some people argue that skipping the deacons’ responses is necessary for time management, the idea that the Divine Liturgy must strictly follow a schedule and end at a specific time to meet the expectations of the people. Is this a viable argument? While I certainly appreciate the need to be reasonable in the timing of the Divine Liturgy, I don’t think the answer is skipping the deacons’ responses, because they really don’t take much time at all. In the Divine Liturgy of St. Basil, we have Seven Minor Litanies that are recited after the Epiclesis, or consecration of the Mysteries. If each response took 30 seconds to chant (and that is being generous considering most of these responses are short), then it will take a total 3.5 minutes for all of the deacons’ responses. What is 3.5 minutes in a service that lasts almost 3 hours? Perhaps the problem lies in the fact that many of the deacons who serve the Holy Altar these days are young boys and men with almost no training whatsoever. I commend them for doing their best to respond well, but more often than not, they stumble through their responses in a distracting manner. Perhaps this is why people wish to skip the responses altogether: they are rarely chanted well these days. But this is the classic causality dilemma (i.e., chicken and egg problem): if more deacons were encouraged to pray their responses, they would similarly be encouraged to learn them well so that they might pray them beautifully and in a timely manner. In any event, I don’t see time management as being a viable argument for skipping the deacons’ responses. I find this argument lacking, because, if there is indeed blind repetition, how can we understand the fact that the Holy Spirit, Who worked through the Fathers of the Church, preserved these responses in our books for centuries? Obviously, these responses were written and handed down from generation to generation. We cannot assume that we are the only enlightened generation that has noticed repetition here. Moreover, although some responses (like that for the peace of the Church) seem to be repetitive, the reality is that the deacon oftentimes commands the people to pray for more than the priest has mentioned. Consider the following example. Remember, O Lord, the Orthodox hegumens and presbyters, and the deacons. Pray for the hegumens, presbyters, deacons, and the seven orders of the Church of God (emphasis supplied). The difference between what the priest and deacon said is the mention of the “seven orders of the Church of God.” In the Canons of the Church, these seven orders refer to the bishop, presbyter, deacon, subdeacon, reader (oghnostos), chanters (psaltos), and the doorkeepers or the entire congregation depending on the source. 1 Canon 10 of Pseudo-Athanasius compares these seven ranks to the Seven Eyes of God as mentioned in Zechariah (3:9, 4:10), the Seven Pillars of Wisdom as mentioned in Proverbs (9:1), and the Seven Spirits as mentioned in Revelation (5:6). The deacon clearly is bringing our minds to ranks that the priest did not mention. His response is not merely repetition, but rather, a restatement and an expansion. We cannot, therefore, justify skipping the deacons’ responses simply because they are repetitive. Yes, they are similar, but not repetitive to the point of obsolescence. The real issue here is deeper than time management and repetition. The real issue is the liturgical role of deacons generally. Today, we oftentimes see young chanters (Psaltos) serving the Holy Altar in place of mature men who received the grace of ordination as deacons. One cannot deny there is a significant difference between a young man in junior high school and a mature man who consecrated his entire life to the service, like a bishop or presbyter. The fact that we now have the former performing the exact liturgical responsibilities of the latter says much about our view of the liturgical role of deacons. And what exactly is that role? The deacon is considered to be a herald in the Divine Liturgy, as St. John Chrysostomos mentioned, 2 one who cries out and exhorts the people to pray for specific things. 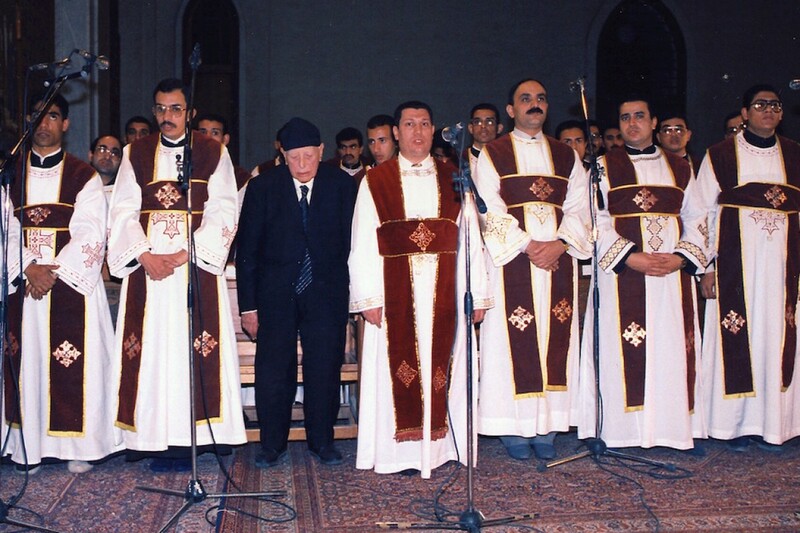 One of the most common responses in the Coptic rite, “Stand up to pray,” reminds us of this unique function of the deacon. He is the one who commands us to stand up, face the East, attend, worship with fear and reverence, and generally, to pray. So important is his role liturgically that he begins for us the proclamation of the Symbol of Faith, the Creed, when he commands us, “In wisdom of God, let us attend. Lord have mercy, Lord have mercy. Truly…” His last word, “Truly,” is the first word of the Creed that we begin to proclaim. When we skip the deacons’ responses, we break this beautiful drama as it was handed down and erode the role of the deacon in the Church generally. As I see it, however, if we accept the necessity of deacons serving in the Holy Altar today (and we certainly do in the modern Coptic Orthodox Church in which it is inconceivable for a priest to serve at the Holy Altar alone), then we should allow them to pray their responses. We should allow whoever is in the Holy Altar to fulfill their role in the beautiful drama of the Divine Liturgy in which everyone, including deacons, have a heavenly image to reflect. We should let the deacons respond. 27 Responses to "Let the Deacons Respond!" One interesting observation is that all the responses of the deacons are addressed to the people and in the form of an order; with one exception (saved Amen with your spirit, let us attend) which is addressed to the priest. None of the deacons responses are addressed to God. A very easy way to focus in the liturgy is to do what the deacon asks us for: when he says ‘pray for the salvation of the world and of the city of ours’, we have to pray for the world and the city we live/lived in; and so on. Surprisingly, many people just ignore the orders of the deacons. 1) Most of the original deacon responses are said in Greek, NOT in Coptic. The point of the deacon responses are always to direct the people. The major language at many times in Egypt was Greek so the deacon directed the people in Greek. The responses that are Coptic are newer responses. Now that they are being said in the same language as the priest we lose out on their original purpose which is a major reason as to why people skip them. 2) on a side note, there are studies being done on responses like sothis amen (saved amen and with your spirit) because it is not an original response in the liturgy and it is not the deacons rite to proclaim an absolution to the priest. Only the laity as a whole can do that, which happens in the beginning of the liturgy of the word. So we need to understand the origin of these responses and what their purpose is. There are many pieces of our liturgy that have been changed incorrectly over time and we need to fix them to have correct understanding. Example of such is the deacon response “Greet one another”. It has completely lost its meaning and purpose because of incorrect liturgical practice. In any of the old manuscripts and even recent books produced by our monasteries, along with the recordings of our hymns in Ragheb moftahs collection we see a completely different rendition with a very specific purpose. Because we’ve lost/stopped practicing the liturgy in its original way, we’ve lost a lot of the meaning as to why we do things. This is why people see no need for the deacon responses. Regarding the absolution to the priest, this is a known and accepted idea in the liturgy. After the priest reads the absolution for the people; the people chant (sotis amen ke to pnevma ti so) then tai shory and so on. Idea is to give the absolution to the priest. I don’t see a problem here. Thank you, Anthony Fanous and Danny Dandoona Girgis, for your comments. As for the Greek/Coptic issue, I’ve heard this many times, but it doesn’t seem convincing, because as they stand now, many of these responses are not exact translations of what the priest said, as I mentioned in the blog post. Since these responses mention more, they shouldn’t be treated as mere repetitions that can be skipped at will. Moreover, let’s just accept for argument’s sake that they are repetitive. That alone shouldn’t eliminate the deacons’ role to command, exhort, etc. Perhaps that repetition is part of the drama of the Liturgy. One cannot deny that the Holy Spirit preserved these responses centuries after the Coptic/Greek dichotomy became irrelevant. Lastly, Danny is correct that many things are out of place in the Divine Liturgy today. However, I don’t think the answer to erosion is more erosion. If things have fallen into disuse, the answer is not to abandon whatever we have left. The answer is to preserve what we have and strive to restore what was lost through humility and education. I heard that both priest and deacon responses were Greek; then only the priest parts were translated to Coptic while deacons’responses were kept in Greek so that people understand them. The monastery of St Macarius recently published the original liturgy text in Greek with its translation. I will double check that and get back to you later tonight !. Anthony, another important thing to note is that the liturgical rite differed from place to place so there are manuscripts of the Greek and the Coptic. Many of the manuscripts abouna Athanasius uses are both Greek and Coptic. Anthony Fanous Hey Anthony where can I find the “Kholagy Al deer al abyad” that you referred to? Sherif Hanna, I got a hard copy from Egypt. May be I can try to get one for you. You can buy it from (Megalet Morcos) either in Alexandria or Cairo. I got mine from St George Sporting bookstore in Alexandria. Let me see if I can help. I checked the books: (1) the Greek origin of the liturgy shows the deacon response only for the litany of the peace of the church. (2) the kholagy of al deer el abyad does not show any of the deacon’s responses to the litanies. Interesting! Will try to dig further. According to Abouna Athanasius Al Makary: the litanies were prayed without the deacon’s responses until the era of St Athanase the Apostolic (328-373 AD), and at the end, the people’s response was Amen. Then St Cyril the great when he edited the liturgy of St Mark, he added the deacon’s response and also added the litany of the pope. He also modified the people’s response to: lord have mercy; as was followed in the other eastern churches. Abouna also added that afterwards, all liturgies in all the churches have deacon’s responses except in the liturgy of the Roman church :). Pray for me ! What if the repitition argument was more thought out than what you had posed? For example, in the Liturgy books, the Priest is saying their part in Coptic and the Deacon response is in Greek – to my knowledge this was because the Deacon was translating so that the congregation would understand what to pray for at that time. If we all understand the common language, whether it be Arabic, English, or Coptic, then what is the point of repeating it again? Also, it isn’t “oftentimes” that the Deacon response is different than the Priest, it’s more common that it is repetitive. Sorry, I just noticed you answered this already. Thank you for the answer. Thank you, Samuel, for your comment. Yes, it is a good perspective, but I mentioned my humble view in my last comment to Anthony and Danny. Either way, I find it difficult to accept that we in the 21st c. are the first enlightened generation in the history of the Coptic Orthodox Church that has noticed this repetition and is willing to remove these responses. The dichotomy between Coptic/Greek has been dead for about a thousand years, but the Church has kept these responses in Arabic. I don’t know if it’s humble of us to assume we know better than our Fathers who preserved these responses even when Coptic/Greek was no longer an issue. As I said in the post, perhaps the Holy Church will decide to remove these responses and eliminate the liturgical role of the deacon altogether. If She does, I will obey, but my argument in this post is that, as long as we accept a liturgical role for deacons today, we might as well let them do what they’re supposed to do. Abouna Moses Samaan I agree with you in that we shouldn’t let go just because things are already messed up, but I think we need to have a massive movement in restoration of our liturgy. The idea that some responses add more than the priest part is true and I also agree with you on that. But that doesn’t negate that the deacon response was directed to the people in a different language so they could understand. What I mean by that is that he directs them more so. Both the priest and the deacon have the same idea, the deacon is just explaining more. I don’t that is an argument to say they shouldn’t be skipped just because he says some extra words. I think the argument should be they shouldn’t be skipped because it is part of a dynamic liturgy in which everyone is participating and following a certain role. Thank you father for a great article. Thank you all for an enriching discussion. I thought it’s worthwhile mentioning that the deacons( chanters) in the parish of Asyut, Egypt say the litanies responses in Coptic if the priest is praying in Coptic. We had a little notebook with all the responses translated in Coptic. Thus, I’m not really convinced with the “translation” role of the deacon, I feel it is more for emphasis and expansion of the prayer as father Moses mentioned in his article. I’m so happy Father Moses brought this up. Tradition is inherent in orthodoxy, and I hope this article acts as a calling to the church not to let our traditions erode as they are intertwined with our church history. Let the deacons respond to the litanies! Those who are “full” deacons, when they are around (which continues be rare in the church as a whole), hardly fulfill their proper role as deacons. We typically see them more as time-savers by virtue of the fact that they can administer the Blood of Christ to the people. So we have a deacon but still allow a seven year old say the Deacon responses (if we even say them). Moreover, we find it to be a cute blessing to have a bunch of 5 & 6 year olds “dress.” This has played a central role in totally eroding the ranks of chanters, readers, and the various levels of the diaconate, or so it seems to me. And it is very difficult even at the parish level to work on this because 1) people have the expectation that their little ones should “dress,” and 2) one cannot say “no” to them because this has become a practice blessed in the church. I agree with your Reverence, Fr. Pimen. The issue is complicated on more than one level. From one, preserving the responses even from the mouths of children might help preserve the proper role of deacons generally, but from another, that very action eliminates the need for training and ordaining ‘full’ deacons, which further erodes the rank generally. As I said before, if we accept the idea of deacons serving the Holy Altar (whether they be chanters or ‘full’ deacons), we might as well preserve their liturgical role until the Holy Church offers a more systematic solution. Otherwise, we lose not only the liturgical role, but even the small remnant of ‘full’ deacons that exist throughout the Church. Yes, I agree, my father. I guess we also need to actually have some assessment of what the roles of the various ranks actually are.